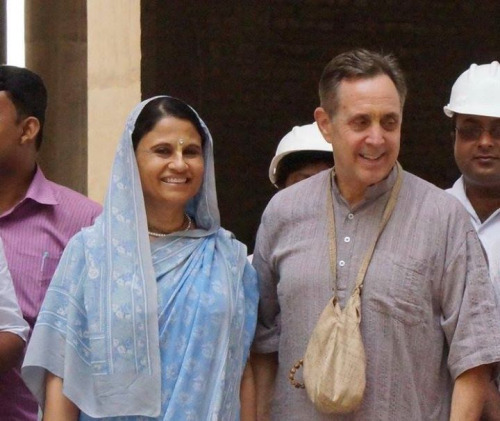 Times Of India: Ahmedabad: Alfred Brush Ford and his wife Sharmila organised a fundraiser at Iskcon temple on Saturday evening for the ambitious Sri Mayapur Chandrodaya Mandir (Temple of the Vedic Planetarium). Ford had started his Gujarat travels from February 1. It was the first state on his pan-India itinerary. Alfred is the great-grandson of the founder of Ford Motor Company, Henry Ford. "Gujarat is a state blessed by Lord Krishna," Albert said at the Ahmedabad meeting. "It is a great pleasure to be here. I had been to Rajkot and Dwarka several years ago. Our collection of funds is going very well. We were ably supported by Jasumatinandan Das in the cause. We have collected over $1 million (approximately Rs 6.72 crore) in just three days which is very encouraging." Talking about the temple project that started in 2009, Albert Ford said they are following in the footsteps of Srila Prabhupada, founder of Iskcon, who had dreamed of a spectacular temple at Mayapur as a tribute to Chaitanya Mahaprabhu. "The process started with his travels to the West and sharing his dreams to revitalise Veda and ancient culture in India," said Ford, who is chairman of the project. His wife Sharmila said that, for the first time, visitors will be able to see a 3D model of the universe as explained in the Hindu scriptures. The 350-feet-high temple will show Golok Dham at the top and Patal at the bottom, Ford said. Brij Vilas Das, director of fundraising, said that apart from a personal donation of Rs 250 crore by Ford, the project has collected an additional Rs 100 crore for the temple which is expected to cost Rs 700 crore. "Around 95% of the construction for the primary structure has been done. We expect the project to be complete by 2022. An 80-feet-high Kalash will be established above the dome this March," Das said.